This luminous 14K white gold floral wedding band is a delicate tangle of organic forms. 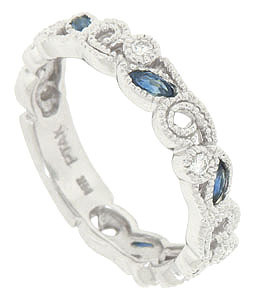 Single diamond set blooms and sapphire encrusted leaves spin in unison around the antique style wedding ring. The ring measures 4.34 mm in width. Size 6 3/4. We can re-size or reorder in any size. Also available in 18K, yellow gold and platinum.